Eagle Valley's Shelbi Lubbers fires one over against Palisade on Saturday, Sept. 8, in Gypsum. The visiting Bulldogs won a marathon in five, 24-26, 29-27, 24-26, 25-21, 15-10. GYPSUM — And the scramble for the 4A Western Slope volleyball title begins, and it’s going to be crazy. Palisade outlasted Eagle Valley, 24-26, 29-27, 24-26, 25-21, 15-10, on Saturday, Sept. 8, in the league opener for both teams. MacAskill helped, too. She had 35 kills. That’s not a typo. Palisade overcame a 2-1 deficit in this one. Alexandra MacAskill said that two-point set losses in a defeat at the hands of Montrose on Thursday, Sept. 6, helped her team push through on Saturday. Eagle Valley did its best to stay with the Bulldogs, despite a cavalcade of injuries. That said, the Devils’ Elyse Fitzgerald had a big game, after playing more of a supporting role the last few years. Bree Gates and Shelbi Lubbers were swinging away with gusto. Meanwhile, sophomore Eliza Wetzel made here presence felt in big moments. 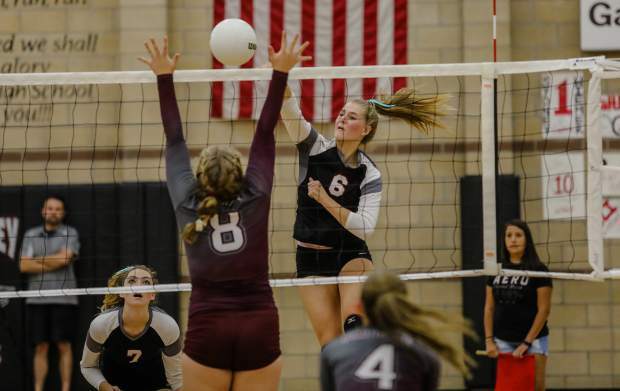 “I thought they played well and Palisade is a great defensive team and Alex is tremendous hitter,” Rindy said. Palisade returns home on Tuesday, Sept. 11, to face Battle Mountain, which has already won at Glenwood Springs. Meanwhile, Eagle Valley heads to Steamboat Springs on Thursday, Sept. 13.